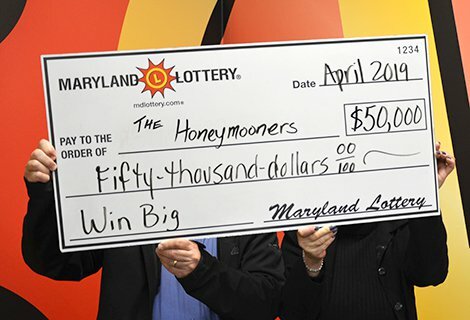 A Washington County couple celebrated their $50,000 prize on the Win Big scratch-off game. Spring wedding season is here, and that thought wasn’t lost on a Washington County woman who was the latest recipient of Lottery luck. As she visited the Winner’s Circle room at Lottery headquarters, she said she had a streak of coming close without winning. But that was before the 65-year-old took a small detour and won $50,000 on a $20 Win Big scratch-off! “I was always a bridesmaid but never a bride,” explained the retired IT supervisor. It wasn’t until she and her husband stopped at an unfamiliar gas station that things began to change. As she was cashing $24 worth of prizes on draw game tickets, the $20 Win Big scratch-off game caught her eye. Shortly after purchasing the ticket, she scanned its prize check area using the store’s counter scanner. When she saw a large number flash back at her on the retail display, she froze and examined the ticket closely, trying to make sense of what she saw. Suddenly she stopped and rushed out the door! “I was so nervous I had to stop. I wanted to make sure I could drive home,” she explained. After safely arriving at home, she uncovered the final part of the ticket. That’s when she found the reason for all the fuss. Several winning spots were scattered all over her ticket’s play area. When she added all of them up it totaled $50,000!